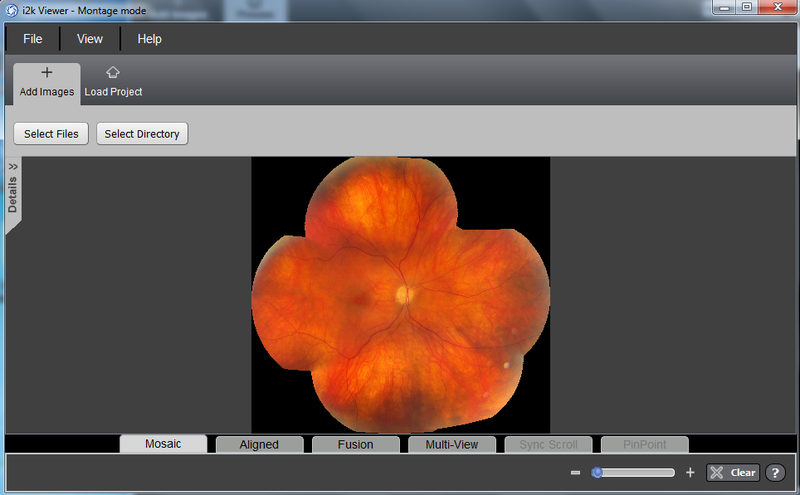 This is a first example that illustrates the basic functionality of i2k Retina in building a mosaic of color fundus images. The screenshots below are all taken on a Windows computer, but the appearance on a Mac is only slightly different. Just below the top menu are two tabs on the left, giving the choice between the Add Images display and the Process display. 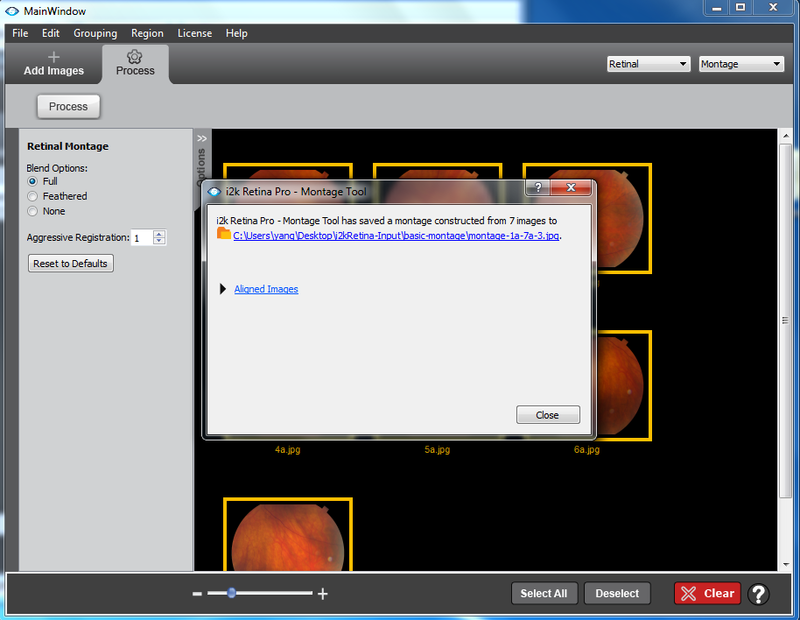 On the right, at the same level as these tabs, are two drop down menus providing the ability to select the image type (Retinal, Photographic, Single Modality and Multimodal) and the processing type (Montage, Align, Montage Seq, and Transform Only). 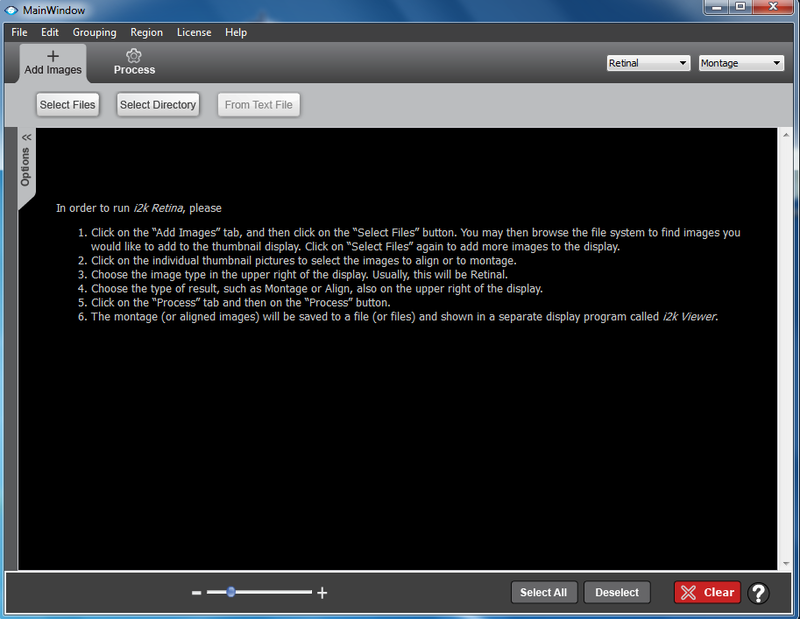 The same image type and processing type are also available under menu Edit. 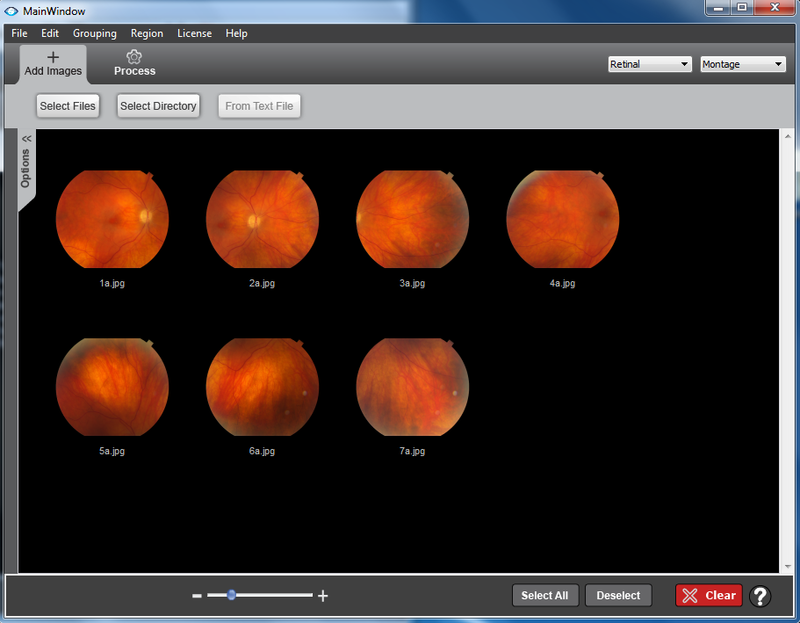 For this example, these drop downs show Retinal and Montage. 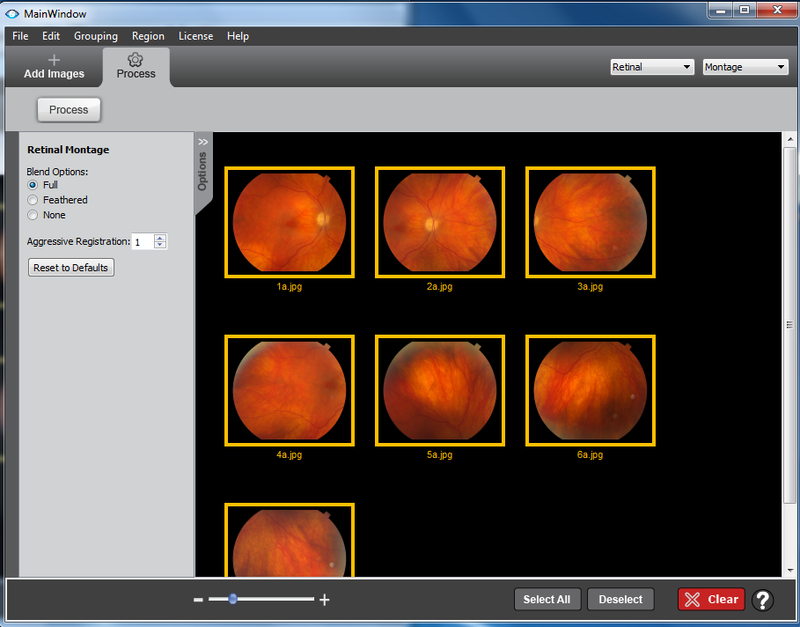 Users of i2k Retina will primarily select the Retinal image type. This example describes Montage processing. Other examples illustrate other processing types. With the Add Images tab showing, the user can Select Files, Select Directory, or tell i2k Retina about the images From a Text File. After clicking on Select Files, browsing the file system, and selecting seven images, the following display is produced, showing thumbnails of the images in the central area. At this point, i2k Retina knows about these images, but has not yet been told which images to process. The easiest way to select images for processing is to left-click every thumbnail that should be added to the constructed mosaic. Each click places a yellow rectangle around each image, clearly showing which images have been selected. Doing so for all seven images produces the highlighted display shown here. Along the bottom of the display the user has the ability to change the size of the thumbnails, Select All, and Deselect all images. Clicking on the red Clear button tells i2k Retina to get rid of all thumbnails shown in the display, preparing it to start over with a completely different set of images. Properties of each image can be found by right-clicking on any thumbnail. 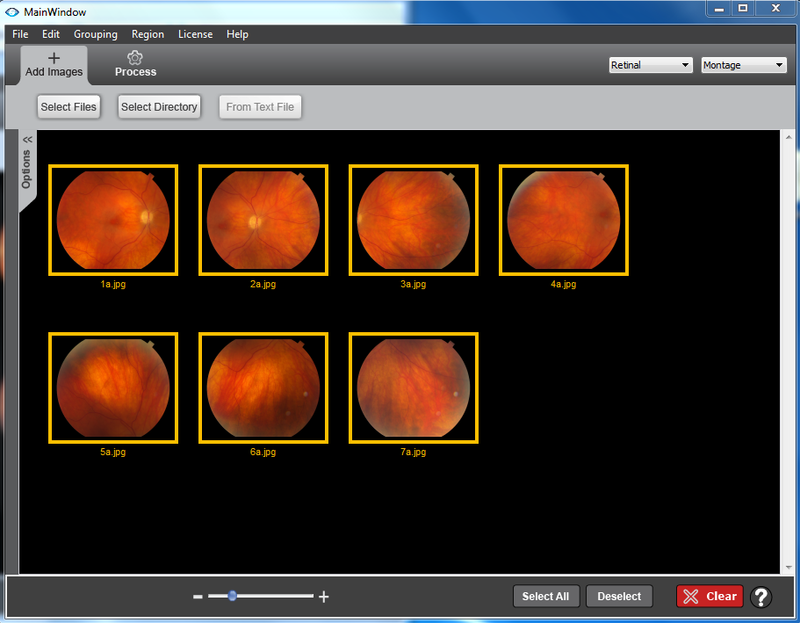 There are relatively few options for Retinal Montages. The first is the Blend option, through which the user can decide if Full blending is desired, including seam-selection and color and illumination correction. This is the default, but some users just want Feathered blending, which produces a gradual transition between overlapping images; others want no blending at all. The open allows the user to scale up the Aggressive Registration setting. In the vast majority of cases, this setting should just be left at 1. Increasing the value tells i2k Retina to try harder (and take longer) to register images. The setting should only be increased when the user is sure the images really overlap, despite appearance differences. Note that increasing this setting to its maximum value of 10 does not guarantee the i2k Retina will register two images that have nothing or almost nothing in common. 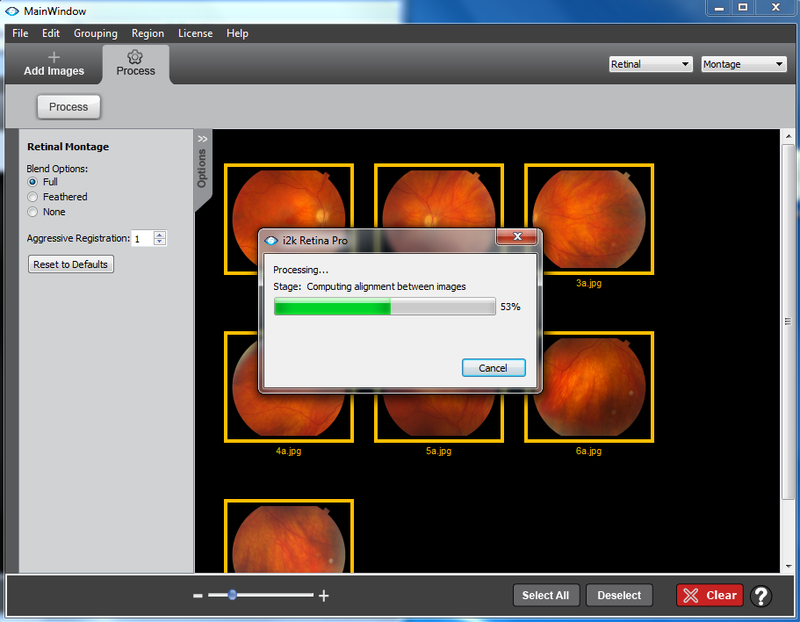 Once the user has decided on the options � or chosen not to consider any options � clicking on the Process button (below the Process tab) launches the actual computation of i2k Retina. For small sets of images, this takes several seconds, and during the computation a progress bar is displayed. Once the computation is complete two new windows pop-up. The larger of these is a separate program called i2k Viewer, which allows uses to interact with the images produced by i2k Retina. For a constructed montage, this is primarily zooming in on and scrolling through the montage under the Mosaic button. For aligned images and sequences of montages, more sophisticated interactions are possible.ferent. If we were proceeding to compute a camera model for rectification based on these correspondences, these weights should be factored into the estimation process. The second, and smaller, new window summarizes the results of i2k Retina, including the location where the montage was written. By clicking on Aligned Images, the user can also see the names of the images used to form the montage. If any images were left off, they would be listed separately in this window as well. Closing this window puts the user back to interacting with i2k Retina.